1.) Miscarriage and MTHFR mutations: A clinical study to determine a link between recurrent embryo loss and Methylenetetrahydrofolate reductase (MTHFR). The first trimester is the most critical period for a human pregnancy. Our aim in this investigation is to find if there is a link between early miscarriage in Estonian population and polymorphic mutations in MTHFR gene. Our focus is on two mutations, C667->T and A1298 ->C that are thought to be responsible for massively elevated plasma homocysteine concentrations which can result in homocystinuria and homocysteinemia. Our clinical study comprises of two group of women; control group with two or more healthy children and a test group of women with two or more miscarriages. Blood samples will be collected from all patients. Biochemical parameters such as folic acid and homocycteine will be compared. 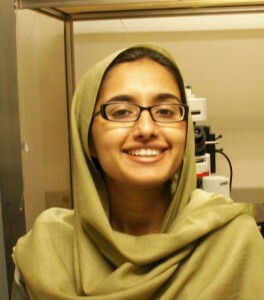 We will perform genotyping on the DNA isolated from blood samples of the patients to look for mutations in MTHFR gene. Analysis of this initial data will guide our research direction. 2.) Consequences of Elevated reactive oxygen species(ROS) in Nrf2 knockout mice. In NF-E2-related factor 2 (Nrf2) Knockout mice, ROS levels are elevated. As in the development of most cardiovascular disease, increased ROS levels have a role to play, these mice provided a good model to study Ca2+ signaling in cardiac myocytes. As a preliminary study, three set of experiments were planned; measurement of Ca2+ sparks, Ca2+ transients and effects of Antimycin. Our initial results indicate severe differences in Ca2+ transient and spark characteristics in control and knockout mice. From this initial data, we hypothesize mishandling of Ca2+ removal from the cytosol either by extrusion from the cell or by uptake in the sarcoplasmic reticulum. At the moment, to better understand the differences in these mice, we are conducting extensive gene expression profiling. 3.) Restitution of Ca2+ sparks. The mechanisms responsible for the termination of Ca2+ sparks and refractoriness after termination remain a subject of debate. While local depletion of SR Ca2+ is clearly important for spark termination, the roles of SR refilling versus time-dependent changes in Ryanodine receptor (RyR2) gating in refractoriness and recovery are unclear. Using a previous experimental technique (Sobie et al 2005, Journal of Physiology), in this study we are altering RyR2 gating behavior with different drugs such caffeine, tetracaine and isoproterenol and studying characteristics of consecutive Ca2+sparks arising from the same RyR2 cluster. The figures below are extreme representations of how consecutive spark delays change with different drugs. Our aim here is to measure spark-to-spark delays and ratios of consecutive spark amplitudes to assess which mechanism might be primary in termination of Ca2+ sparks. 4.) Prediction of local calcium dynamics. Under pathological conditions such as Ca2+ overload spontaneous Ca2+ sparks can give rise to regenerative Ca2+ waves whereby sparks trigger additional sparks from neighboring clusters of sarcoplasmic reticulum (SR) Ca2+ release channels (ryanodine receptors; RyR2s). Controversy exists, however, regarding the relative importance of two competing mechanisms where one proposes cytosolic diffusion of Ca2+and activation of neighbouring RyR2 clusters through Ca2+-induced Ca2+ release versus the second that proposes cluster-to-cluster diffusion of Ca2+ within the SR network sensitizing RyRs at sites that have not yet been activated (un-activated sites). To address this problem we are implementing a computational model of cytosolic and SR [Ca2+] during Ca2+ waves. The figure below is of simulations where we investigated how dynamic local changes in SR [Ca2+] were influenced by diffusion of Ca2+ in the SR. Image is space-time representation of cytosolic [Ca2+] (on a logarithmic scale) during a Ca2+ wave (left). The corresponding image of SR [Ca2+] is at right. Transverse tubules are indicated by horizontal white lines. 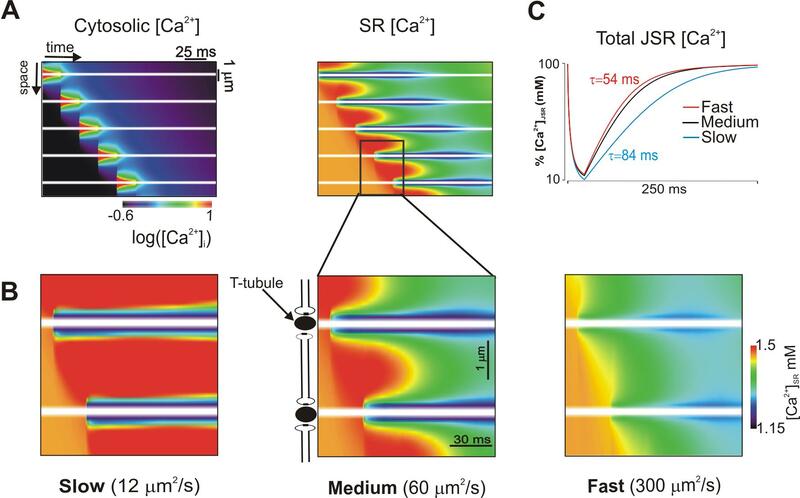 Spatiotemporal changes in [Ca2+]SR within two sarcomeres are displayed for three values of Ca diffusion constant (DCa,SR) (B). Slow SR diffusion leads the most dramatic increases in[Ca2+]SR above the baseline value (1500 µM) in unactivated regions. Recovery of total JSR [Ca2+] after release at an individual site depends on DCa,SR. Time constants range from 53 ms (fast) to 84 ms (slow). Ramay, H.R., and Vendelin, M. (2009). Diffusion restrictions surrounding mitochondria: a mathematical model of heart muscle fibers. Biophysical Journal, 97, 443 – 452. Ramay, H.R., Fabris, F., Noel, O., Sarkar, A. (2008). An il-lumen-ating look at ryanodine receptor modulation by disruption in triadin and calsequestrin interactions in cardiac myocytes. Journal of Physiology-London, 697 – 699.